NEW YORK (Reuters) - Amazon.com Inc <AMZN.O> shares seesawed on Thursday as investors questioned how the impending divorce of company founder Jeff Bezos would affect his control of the most valuable company on Wall Street and its ambitious expansion plans. Bezos, whom Forbes lists as the world's richest person, worth an estimated $136.2 billion, said via Twitter on Wednesday that he and his wife of 25 years, MacKenzie, will divorce. Amazon shares were down 0.5 percent in afternoon trading on Thursday, after gaining earlier in the session. 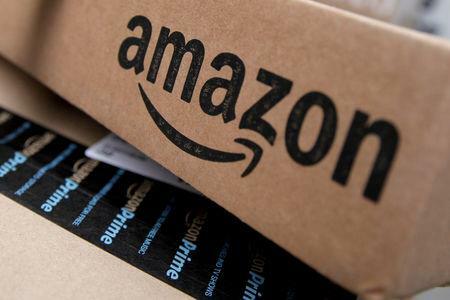 The split throws into question how the couple will split their fortune, which includes an approximately 16 percent ownership stake in Amazon's roughly $811.4 billion market capitalisation. Divorce laws in Washington state, where they live, hold that property acquired during a marriage is generally divided equally between spouses. Most analysts and fund managers are largely sanguine and say the divorce will not lead to any significant change in the company's leadership or its growth prospects. Prominent short-seller Doug Kass, however, who runs hedge fund Seabreeze Partners, said he sold his stake in Amazon on news of the divorce. That was after initially buying a stake in late December and naming Amazon among his "best ideas list." "Is it premature to ask what happens to Amazon when Jeff Bezos chooses to turn over the day-to-day running of the company he founded?" he said. "His announced divorce gives me pause for thought." The couple has multiple residences across the country, so there is a possibility the divorce could be filed in a state where marital property is not presumed to be divided equally. New York matrimonial lawyer Bernard Clair said in that case a judge would likely determine MacKenzie Bezos' share of Amazon stock based on her contribution to her husband's success, which could include helping him make important business decisions or raising their children so he could focus on work. Any transfer of Jeff Bezos' stock would be subject to U.S. Securities and Exchange Commission disclosure requirements. As an officer and director at the company, Bezos could be required to file an SEC Form 4 within two business days of any transfer, though former SEC lawyer Broc Romanek noted a provision of U.S. securities laws exempts share transfers made pursuant to a domestic relations order. Even if Bezos were exempted from filing a Form 4, he would be required to update promptly the record of his Amazon holdings on file with the SEC if his position in the company changed by 1 percent or more, said D.C. securities lawyer Thomas Gorman. MacKenzie Bezos would also need to file a similar record if she received more than 5 percent of Amazon stock. Peter Henning, a securities law professor at Wayne State University, noted that Amazon, unlike fellow tech giants Facebook Inc. <FB.O> and Google Inc <GOOGL.O>, does not give its founder's shares greater voting rights. If MacKenzie Bezos is given a large block of shares, she could have a big say at the company. Any effort to dilute MacKenzie Bezos' voting rights by creating a separate class of shares would require a shareholder vote, said Gorman, though he added that he thought such a move unlikely. “Nobody wants to run their divorce through a shareholder meeting,” he said. Robert Bacarella, portfolio manager of the Monetta fund, said that while he is not changing his investment in Amazon, he expects other growth-focused portfolio managers may trim their stakes due to concerns about the divorce's impact. "This is such an over-owned company and this gives them an excuse to say 'Maybe I'll trim some back because it adds a new question mark'," he said. Bacarella, however, said he is not concerned because even if MacKenzie Bezos liquidated a stake that could be as high as 8 percent, there would be no fundamental reason behind the sale. Any impact would be short-term in nature. "Unless you worry that he will get so distracted by the divorce that he cannot manage the company, this will be a non-event," said Michael Pachter, an analyst at Wedbush Securities in Los Angeles. "He is given control of the company because shareholders like him and his vision, not because he has 50 percent of the stock." Thomas Forte, an analyst at D.A. Davidson, said questions about the future of the company due to the divorce are legitimate due to Jeff Bezos' outsized influence on its value. Should he leave the company for any reason, its shares would likely immediately fall more than 10 percent, he said. “His influence on the company is as a significant as if he had super-voting shares because of his track record and the way he runs the company as if he owned the whole thing," he said.